Tired of a messy bathtub? 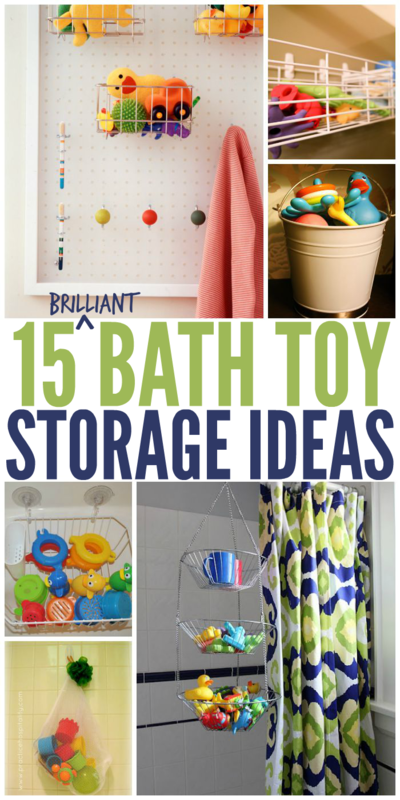 Here are 15 ways to store bath toys for a neater bathroom. If you’re tripping over bath toys every time you shower, it’s time to get a storage system in place. Believe me, I’ve stepped on my fair share of ducks, trains, boats and Ninja Turtles because they were littering the bathtub floor. We’ve rounded up 15 bath toy storage solutions that are easy to implement and maintain. Which one is your favorite? 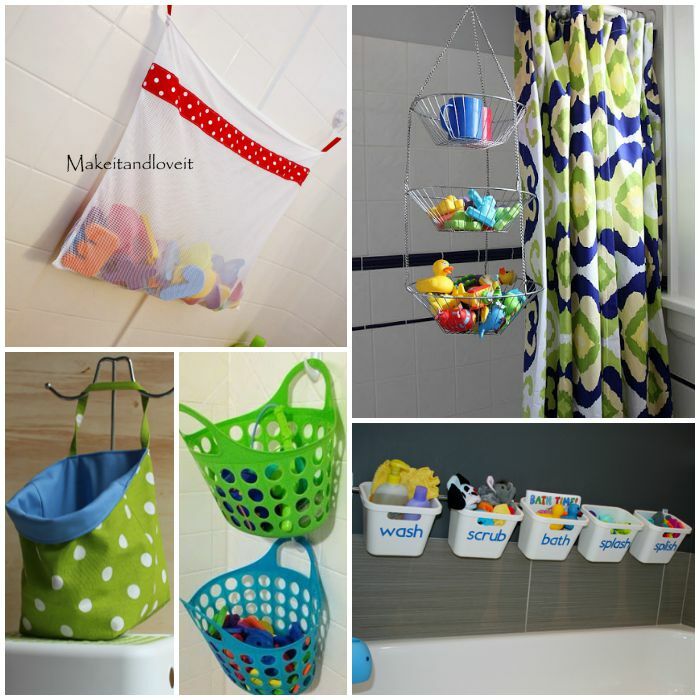 A simple system of Command hooks and cheap baskets from the Dollar Store can work wonders toward keeping your bathtub clear and free of toys. A metal hanging fruit basket adds a stylish touch to the shower, and it’s super practical because it allows the toys to drain well. Make your own bath toy bag to coordinate with your bathroom decor, and hang it from your shower head or some hooks on the wall. You may want to let the toys air dry before putting them in a bag like this, though. A DIY mesh bath toy bag allows the toys to breathe, so you can put them in right away after your kiddos are finished with bathtime. Put up a rail and some hanging baskets for convenient bath toy storage that the kids can reach. When you have company, replace the bath toys with more guest-friendly amenities such as soaps, towels and a fresh loofah. Cover an ordinary storage cube with your favorite fabric, and you’ve got a lovely place to store toys as well as seating in the bathroom when you’re helping the kids. If you’re not up for making your own mesh bag, a lingerie bag works in a pinch! It will let toys dry, and you can find them for as little as $1 in some stores. 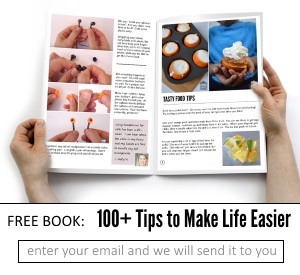 Baskets and suction cups are also a workable solution. We don’t have much luck with suction cups on our current tile, but this has worked for us previously. You don’t need an expensive rod and basket system for the toys. 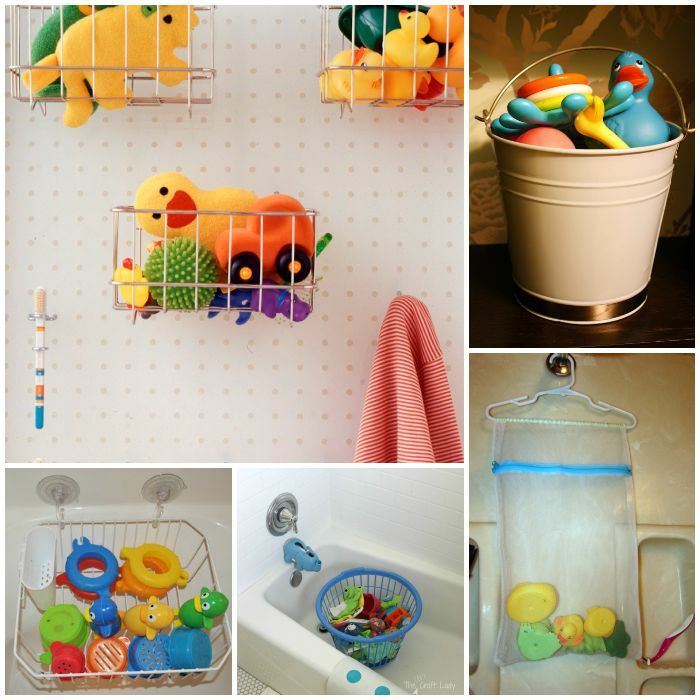 A simple tension rod paired with baskets and S-hooks does a beautiful job of storing bath toys! Wire baskets on Command hooks are sturdy and practical. Pretty pails are nice for storing bath toys, and you can hang them, put them on a shelf or place the buckets on the floor. Easy! 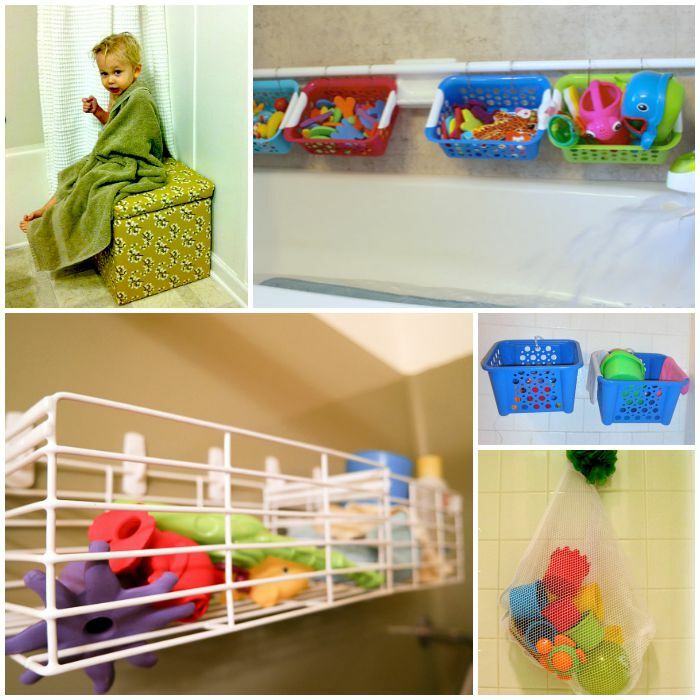 Hang a dish drying rack on command hooks or suction cups for a larger “basket” for the toys. This clever mom sewed a mesh sock bag over a clothes hanger for convenient hanging bath toy storage. Add a peg board to your bathroom wall for towel hooks, toothbrush holders and, of course, bath toys in baskets. Perhaps the simplest solution of all is a small, cheap laundry basket sitting in the tub. It’s easy to remove when someone else needs a shower, but it still keeps the toys contained.